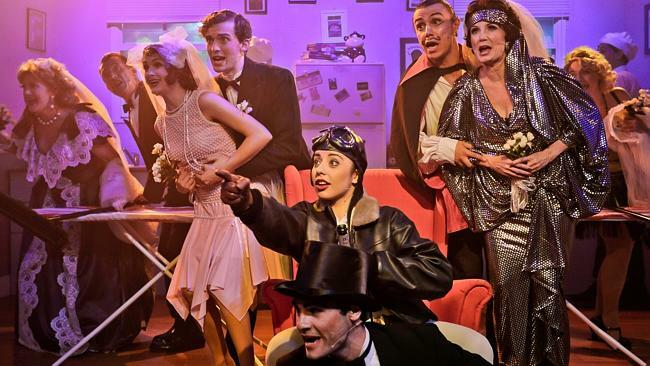 At its surface, The Drowsy Chaperone is an almost flawless piece of theater into which Squabbalogic manages to incorporate a low-budget-ness, seamlessly including what they can’t afford into its identity. It’s very intelligently interpreted, working to its limitations by choosing to include them as strengths, and takeing its perfections and making them part of the backdrop. The result is a piece of world-class theatre that genuinely could be shown on any stage in the world. According to their Facebook Page, The Drowsy Chaperone is almost sold out, so take it as no small thing when I urge you, in the opening paragraph of what we all know will be a long review, to stop reading immediately and try to grab a ticket. There will be no second thoughts about the investment, and the bang for your buck is sure to include bragging rights at the end of the year when The Drowsy Chaperone picks up all the awards it is entitled to. Lisa Lambert and Greg Morrison have built an ode to the musical comedies of the 1920’s that includes in its sycophantic love a healthy dose of parody. It is aptly billed as a musical within a comedy, transparent in its unashamed passion for those musicals we’re not really sure what to do with anymore (they’re so lame, but the lameness is part of the perfection and we dare not mess with it) while wrapped in the comic stylings of BobMartin and Don McKellar who contemporise through the memory of one man whose comedy is also a tragedy of sorts, his shut-in lifestyle equally as emblematic of the truth that times gone by include real flesh and blood folk, as well as nostalgia. Appropriately, a piece of theatre this good won all the Tony’s and Drama Desks it was nominated for. Everything in the original design of The Drowsy Chaperone is excellent but its juxtaposition of delicately subtle humour against the in-your-face overt campiness of its subject matter is a cerebral pleasure that far surpasses what could be expected from the premise. With an uncanny talent for picking the right pieces (Squabbalogic brought Carrie the Musical back from infamy in 2013) Jay James-Moody directs and stars in the latest birthing of The Drowsy Chaperone at The Hayes theatre, including the talents of the rest of the Squabbalogic team, Jessica James-Moody as producer and sound designer (this is one of those performances where you notice the brilliant sound work) Luke Erickson and Craig Stewart as associate producers, all on board and dedicated to the professional standard of theatre Squabbalogic is fast becoming famous for. They’ve built a fine creative team around them, particularly Paul Geddes as musical director who also plays piano in the orchestra somehow magically buried yet always apparent and Monique Salle as choreographer and character Trix. This core talent spirals outward to bring all its creatives into its nest of impossibly high, and yet perfectly executed standards. The Drowsy Chaperone at its heart is the story of a man who is “blue” and though we’re not entirely sure why, but he describes himself has having a “self-conscious anxiety resulting in non specific sadness”. Because when he is “blue” he likes to listen to his music, he pulls out his remastered double album recording of The Drowsy Chaperone, first recorded in 1928 and true to the magical spirit of music, something we all understand despite variety of taste, he is swept up into a comic, joyful world filled with music made for pleasure; a simplified plot that allows for easy distracted mind ramblings (our man states at the begging he didn’t pay good money to have the fourth wall come crashing about his ears) which he punctuates with the wit and cleverness of the truly obsessed in front of a captive audience. The 1928 recording comes alive on the stage before the audience, complete with scratches and static, resulting in a jaunty stroll down memory lane that captures the spirit of the time for aficionado and novice alike. 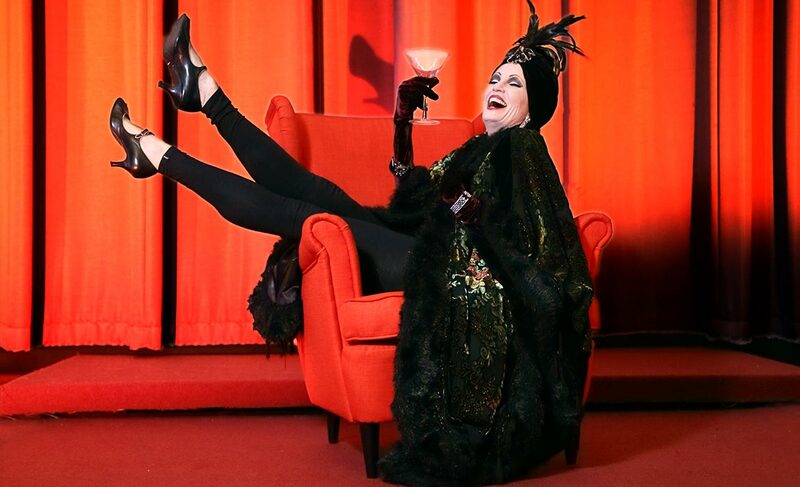 However, at the heart of The Drowsy Chaperone is the man in a chair’s enduring sadness, connected here to time, memory and nostalgia in a rapturous melancholy that hints at our perverse knowing that all things pass and all joy is fleeting. It is summed up in a plea he makes to the audience at a moment when the recording jumps (in a brilliant comic construction) robbing him of a piece of crucial understanding – Do I live, leave or love while I can? The man in the chair cries to the audience, “And so you choose, you choose to live” and then you find the consequences of choice far outweigh the conventions that seduced initially and one is left with the tatters of a life that is clinging to a mantra that claims ( even if in your particular case it may not be so) on behalf of a universal, surely its better to choose to live in that moment still? Our man in the chair made the mistake to choose to live once, and now he has chosen not to author his own life, but to live vicariously through something else, and allow for the frequent moments of “blue.” Despite its statement of refusing depth, it is this lilting, gentle moral core of The Drowsy Chaperone that allows for the comedic expanse, resulting in a charming narrative about why comedy sits always so very close to our own personal tragedy. Jay James-Moody is the man in the chair, and true to the spirit of that character, he also directs this production, bringing the two roles together so that they coalesce in front of us, a perfect ode to a clever meta narrative that is the platform upon which The Drowsy Chaperone is built. He is perfect, instantly engaging from the first moment when he says to the audience in the dark “I hate theatre” to the very final lines sung with the chorus “the very best that we can hope for is that a bluebird will sing his song, as we stumble along.” His talent for intuiting the spaces in comic timing, combined with his dead pan stare are funny and intimate together, bringing the audience into his world with his geeky sirens call. This combined with a stand out cast led by Hilary Cole and Michele Lansdown makes for a superb production with everyone embodying the spirit of the performance they represent. The cast are assisted by Lauren Peters amazing set (that does more with economy of scale than you can imagine) and Elizabeth Franklin’s impeccably researched costuming that enhance and stimulate the performances so that the visual ties us as much to its time period as the performances. The Drowsy Chaperone has been performed by independent ensembles all over the word (many of them are on You Tube) but this production stands head and shoulders above the rest, and is a unique opportunity to see world-class theater in an indie setting.